New Games From Calliope? We Got 'Em! Home / Recreation / Games / New Games From Calliope? We Got ‘Em! When I first saw Got ‘Em! in Calliope Games‘ booth at Gen Con, my first thought was it was a reissue of a Thrift Treasure we featured last year. 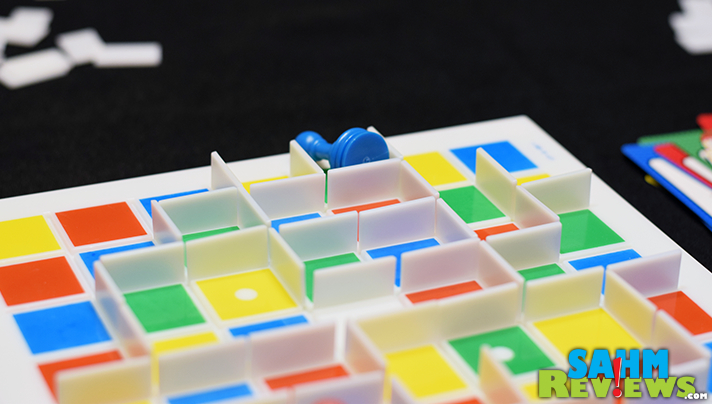 Blockade (and later Quoridor) looked very similar – a plastic board with grooves and colored player pegs. That was fine with me because today we still enjoy a quick game of Blockade when there are only two of us. As it turns out, that was the only similarity – Got ‘Em! was a very different animal, and one that supported up to four players! The first thing my daughter commented on was the cutely-designed game box done in a comic book style, all the way down to simulated rosette printing patterns. In Got ‘Em! 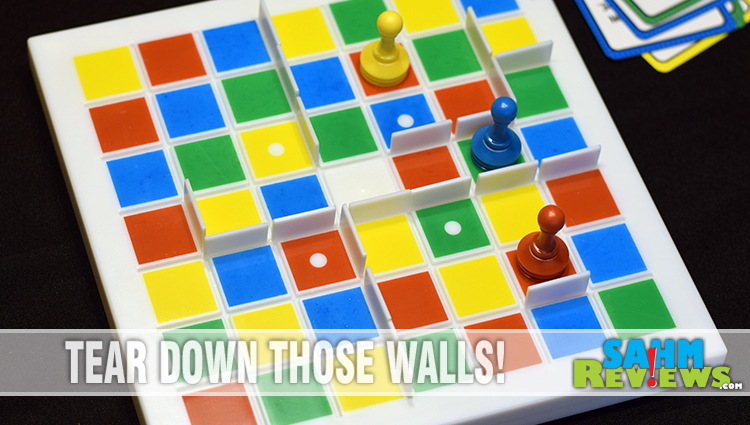 you are simply trying to outlast your opponents by trapping them on the board before they trap you. For the base game, each player is dealt a hand of three cards. On their turn one card is selected to play and the actions on the card are performed. 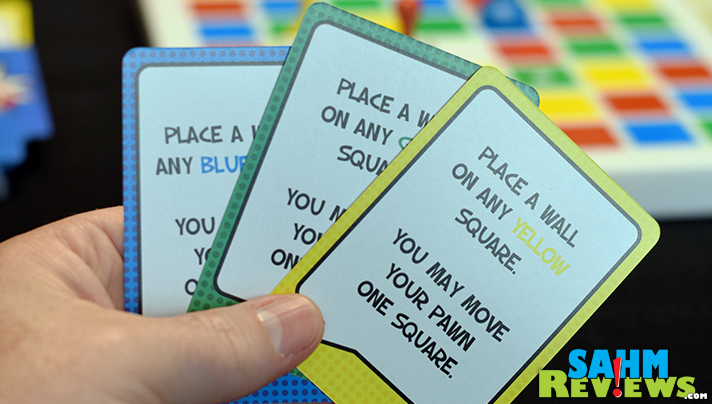 Most cards simply allow you to place a wall adjacent to a colored square and then move your own pawn up to 1, 2 or 3 spaces. 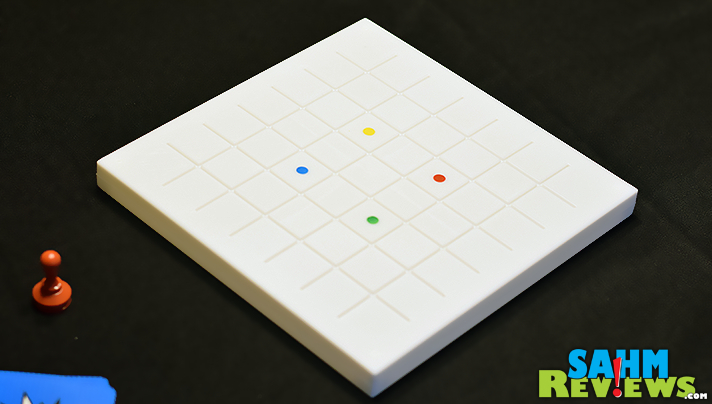 Each player starts in a predetermined spot on the board matching the color of their pawn. Your movements are horizontally or vertically (not diagonal) and typically not through walls (although there are special cards that will allow it). After your card is played, draw back up to three cards. 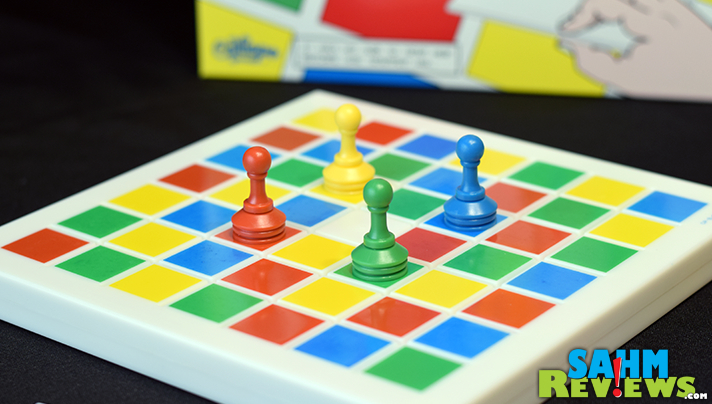 Play continues in order until the inevitable happens – someone has their pawn surrounded on all four sides. The special card won’t help you at this point as you are eliminated the second you are surrounded! This is usually accomplished by multiple players ganging up on one person (sorry Nicole)! But then those players must turn on each other to decide the final winner. And on this day, dad finally got his win. That’s not to say our youngest didn’t put up a great fight. At 11 years old, this game is very easy for her to learn and still presents a substantial challenge when played against someone more experienced. Rated for ages 8+, that’s about the right minimum age that I’d recommend. But Got ‘Em! has something unique up its sleeve. Turn the board over and you have a completely different game. Notice the lack of color, so the cards won’t be used at all. This “brainy” version is a complete free-for-all. On your turn you place a wall anywhere on the board and move your pawn one square PLUS a number of squares equal to the number of walls on the square it currently occupies. There will be no special cards to save you, so you really have to plan ahead. Again, surround an opponent and they are eliminated. Be the last pawn standing and you are the brainiest of them all! So technically you get two games for the price of one when you pick up your copy of Got ‘Em! You’ll find yours on Amazon or direct from Calliope Games. At under $30 and with the 2-game ruleset, it is a fantastic value. Keep an eye on Calliope’s Twitter and Facebook timelines – they regularly offer sales and new product announcements that you’ll want to stay on top of. And we have an even better value for our readers here at SahmReviews! 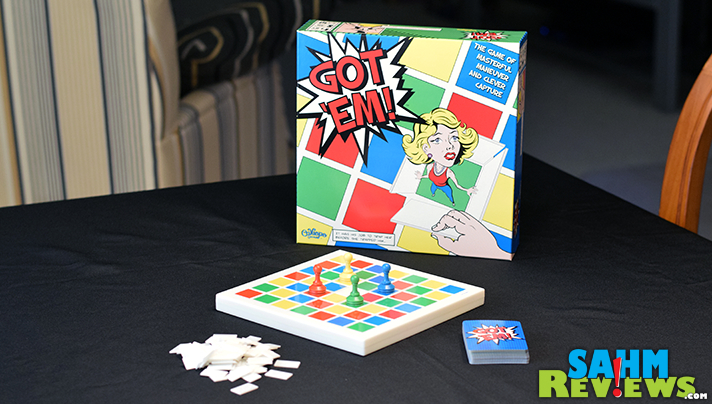 Thanks to the generosity of Calliope Games, we are giving away a brand new copy of Got ‘Em! to one lucky reader! Enter using the form below, and don’t forget to come back each day for additional entries! And don’t forget to check out our other current giveaways while you’re here! Mega Giveaway Day 2 – Roll For It! Love the games Calliope makes! Tsuro being one my and my daughters favorites! 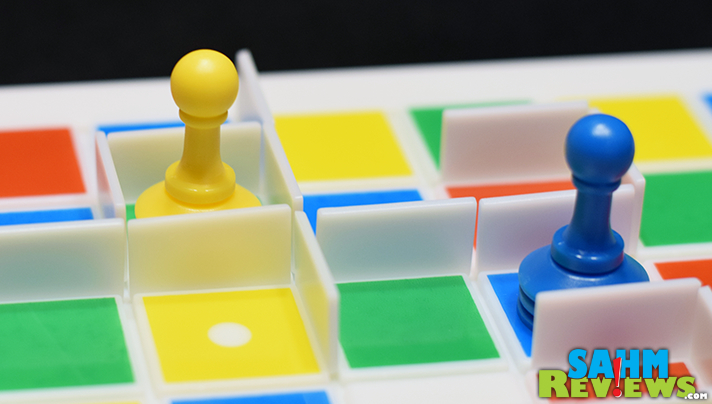 Then you’ll love our giveaway of Tsuro of the Seas as soon as Calliope gets them back in stock! 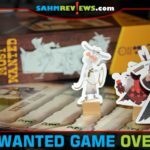 Awesome Giveaway, I’m an avid board game collector and am always looking for new stuff! Thanks for the review and contest! Got ‘Em has been on my radar for a while now! Great contest again, thank you! And no, every family member for himself in boardgames! I’ll sometimes team up if I notice one of my daughters isn’t doing the greatest and is feeling discouraged. I love strategy games! These look fun especially since it will exercise a kids mind! Great review. I love games that make you think.My family will have a lot of fun with this. Great games! Thanks for the share. 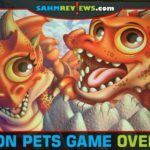 My husband and I are looking for games for multigenerational toddler/adult group game nights! No we don’t team up. The kids like to win on their own, and I am fine with that. 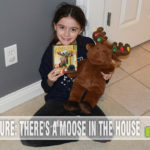 They are great sports when playing games. We don’t team up, but one of my boys likes to go rogue on the rules, while the other likes to follow the rules to a T. So we end up doing some bargaining! These are the type of games that my family loves! Games that make you think, don’t rely on luck or the roll of the dice. I’d love to win this so that my son and I can team up and defeat the evil witch of the house (my wife)!! This game would be a great addition to our game night! This game looks like a blast! I don’t really team up with family members when playing a game. It’s every man for himself. Calliope games are guaranteed quality and fun, thanks for the contest! Great contest hope to win! Thanks for the chance! This game looks awesome! I REALLY hope that I win! Thanks for the great contest! Oh no I never team up unless it’s a game where you are playing as a team. Otherwise it’s each to their own. Let the best Man/Women/Child win lol. No we are pretty much every man for himself! We do team up to play games! Nothing like an afternoon of games with family! I’ll typically team up with whomever is having a hard time playing and try and encourage them. Yes – we team up! This looks like a really fun game to play with my family!